Venus 0.72 225 days 243 days 0.82 0.
celestial body orbiting a planet, dwarf planet, asteroid, or star of a larger size. The most familiar natural satellite is the earth's moon; thus, satellites of other planets are often referred to as moons. in geology and astronomy, 3rd planet of the solar system and the 5th largest, the only planet definitely known to support life. Gravitational forces have molded the earth, like all celestial bodies, into a spherical shape. ..... Click the link for more information. (AU), the average distance between the earth and the sun. The mean distances of the planets from the sun range from 0.39 AU for Mercury to 30.04 AU for Nepture. ..... Click the link for more information. ) than those of a major planet, and Pluto is now recognized as a Kuiper belt, or transneptunian, object. , in astronomy and physics, small force or other influence that modifies the otherwise simple motion of some object. The term is also used for the effect produced by the perturbation, e.g., a change in the object's energy or path of motion. ..... Click the link for more information. ). The equatorial planes of the planets are tilted to various degrees with respect to their orbital planes, giving rise to yearly seasons. The smallest tilt, that of Jupiter, is 3°, whereas that of Uranus is 98°, causing its axis of rotation to lie nearly in the plane of the planet's orbit. The tilt of the earth's equatorial plane is 23 1-2°. Using a chemical approach, H. C. Urey has given evidence that the terrestrial planets were formed at low temperatures, less than 2,200°F; (1,200°C;). He proposed that the temperatures were high enough to drive off most of the lighter substances, e.g., hydrogen and helium, but low enough to allow for the condensation of heavier substances, e.g., iron and silica, into solid particles, or planetesimals. Eventually, the planetesimals pulled together into protoplanets, the temperature increased, and the metals formed a molten core. At the distances of the Jovian planets the methane, water, and ammonia were frozen, preventing the earthy materials from condensing into small solids and resulting in the different composition of these planets and their great size and low density. ..... Click the link for more information. , beginning with 51 Pegasi in 1995 and now numbering in the hundreds, have given planetary scientists pause. Because it was the only one known, all models of planetary systems were based on the characteristics of the solar system—several small planets close to the star, several large planets at greater distances, and nearly circular planetary orbits. However, all of the extrasolar planets are large, many much larger than Jupiter, the largest of the solar planets; many orbit their star at distances less than that of Mercury, the solar planet closest to the sun; and many have highly elliptical orbits. All of this has caused planetary scientists to revisit the contemporary theories of planetary formation. A group of celestial bodies comprising the Sun and the large number of bodies that are bound gravitationally to the Sun and revolve in approximately elliptical orbits around it. The latter include the nine known planets, Mercury, Venus, Earth, Mars, Jupiter, Saturn, Uranus, Neptune, and Pluto (although Pluto may be an escaped satellite); more than 60 known natural satellites of the planets; the numerous asteroids mostly in orbits between the orbits of Mars and Jupiter; the comets, which exist in great numbers beyond the most distant planets; and countless meteoroids. The Sun contains 99.86% of all the mass of the system, while most of the remaining mass is concentrated in the planet Jupiter. In extent the Solar System may be considered as a sphere with a radius greater than 100 000 AU although the planets alone extend to a radius of less than 50 AU (see Oort cloud). With the exception of the comets, all bodies of the Solar System orbit the Sun in the same direction as the Earth, along orbits that lie close to the plane of the Earth's orbit and the Sun's equator. Most objects in the Solar System spin in the same direction as their orbital motion. This motion reflects the common origin postulated for the Solar System by the contraction of a rotating cloud of interstellar gas and dust about 4600 million years ago (see Solar System, origin). The Sun and its entire retinue are moving in a nearly circular orbit around the center of the Galaxy, which lies about 8500 parsecs away in the constellation Sagittarius. They have a mean velocity of about 220 km s–1 (see galactic rotation). In relation to the stars in its neighborhood, the Solar System is moving with a velocity of 19.4 km s–1 toward a point in the constellation Hercules – the solar apex. The solar system is formed by the Sun and all of the various heavenly bodies held within its gravitational field, namely, the planets, their moons, and the asteroids. The orbits of the planets and the asteroids all lie within roughly the same geometric plane, and all move in the same direction around the Sun (all clockwise or all counterclockwise, depending on the position from which they are viewed from outside the system). If the various elements of the solar system were not all within the same plane, it would be difficult to represent astrological influences on a two-dimensional chart. With the exception of some of the fixed stars, all of the influences taken into account by contemporary astrology are confined to our solar system. Robinson, J. Hedley, and James Muirden. Astronomy Data Book. 2d ed. New York: John Wiley & Sons, 1979. Smoluchowski, Roman. The Solar System: The Sun, Planets, and Life. New York: Scientific American Books, 1983.
the system of celestial bodies moving in the region where the sun’s gravitational influence is dominant. The solar system includes the sun, planets, planetary satellites, asteroids, comets, meteoroids, and cosmic dust. 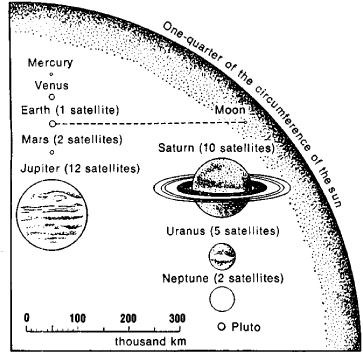 The observed dimensions of the solar system are determined by the orbit of Pluto, which is approximately 40 astronomical units (AU) from the sun (see Figure 1). On the other hand, the sphere within which stable motion of celestial bodies around the sun is possible extends almost to the closest stars (230,000 AU). Information on the distant outer region of the solar system is obtained through observation of long-period comets that approach the sun and through study of the cosmic dust that fills the entire solar system. and made a number of discoveries that were remarkable for his time. While observing sunspots, he detected the sun’s rotation about its axis. In their physical characteristics the planets are divided into the inner planets (Mercury, Venus, the earth, and Mars) and the outer, giant planets (Jupiter, Saturn, Uranus, and Neptune). Since the physical characteristics of Pluto are qualitatively different from those of the giant planets, it cannot be classified as a giant planet. Figure 2 shows the relative sizes of the sun and planets. An extensive program of observations conducted in 1963 by the American astronomer C. Tombaugh in search of planets lying beyond the orbit of Pluto failed to yield positive results. Table 1 gives the osculating elements of the planetary orbits (seeORBIT OF A CELESTIAL BODY) according to Oesterwinter and Cohen of the USA (1972). The orbits of the planets are slightly inclined with respect to each other and to the invariable plane of the solar system. Approximately 90 percent of the natural satellites of the planets are grouped around the outer planets. Indeed, Jupiter and Saturn, together with their satellites, make up, as it were, miniature solar systems. Some satellites are extremely large; for example, Jupiter’s satellite Ganymede is bigger than the planet Mercury. In addition to ten satellites, Saturn has a system of rings consisting of a large number of small bodies whose motion obeys Kepler’s laws; these bodies are also essentially satellites of Saturn. The radius of the outermost ring is 2.3 radii of Saturn—that is, the rings lie within Roche’s limit. By 1976, the exact orbits of more than 2,000 asteroids had been calculated; the orbits lie for the most part between the orbits of Mars and Jupiter. In some cases, the orbits of the asteroids differ considerably in shape and position from the orbits of the planets. The inclinations of the asteroids’ orbits to the plane of ecliptic can be as great as 52°, and the eccentricities of their orbits can be as great as 0.83. Because of their large eccentricities, some asteroids approach the sun closer than does Mercury and move as far away from the sun as Saturn’s orbit. The total number of asteroids observable by present-day telescopes is estimated at 40,000. When viewed from the north celestial pole, the motion of the planets and planetary satellites and the rotation of these bodies about their axes are counterclockwise—that is, in the direction customarily referred to as direct. Exceptions are the rotation of Venus and Uranus and the retrograde motion of some satellites around their primaries. The distances between the orbits of the planets are described by the empirical Titius-Bode law. Comets differ markedly in appearance, dimensions, and orbital characteristics from other bodies in the solar system. The periods of revolution of comets can be as great as several million years; at aphelion such comets approach the boundaries of the solar system and experience gravitational perturbations from nearby stars. The orbits of comets vary in inclination from 0° to 180°. The total number of comets is estimated to be hundreds of billions. the attraction of the sun and planets but also by solar radiation; the motion of electrically charged particles is influenced also by the magnetic fields of the sun and planets. Inside the earth’s orbit the density of the cosmic dust increases, and the dust forms a cloud surrounding the sun that is visible from the earth as the zodiacal light. The question of the stability of the solar system is closely connected with the presence of secular terms in the semimajor axes, eccentricities, and inclinations of the planetary orbits (seePERTURBATIONS OF CELESTIAL BODIES). Classical methods of celestial mechanics, however, do not take into account small dissipa-tive factors, such as the continuous loss of mass by the sun, that may play an important role in the evolution of the solar system over long periods of time. The solar system participates in the rotation of the Galaxy and moves in an approximately circular orbit at a speed of about 250 km/sec. The solar system’s period of revolution about the center of the Galaxy has been determined to be about 200 million years. The problem of the origin of the solar system is one of the most important questions in modern science (seeCOSMOGONY). The solution of this problem is particularly difficult because the solar system is the only such system we have knowledge of. Suppositions have been advanced that the nearest stars have dark companions of planetary dimensions. The existence of such companions is extremely likely, but conclusive confirmation has not yet been provided. The age of the solar system is estimated at 5 billion years. The space age has furnished astronomy with new means of studying the solar system. Soviet and American space probes are intensively investigating the inner planets of the solar system. Soviet space probes have made soft landings on the moon, Venus, and Mars. The first manned landing on the surface of the moon was made in 1969 by American astronauts. Between 1972 and 1974 the American space probes Pioneer 10 and Pioneer 11 were launched, crossed the asteroid belt, and made close passes of Jupiter. Plans are being made for flights to periodic comets and for the soft landing of a spacecraft on an asteroid approaching close to the earth. Mankind is beginning to gain practical mastery of the inner region of the solar system. The sun and the celestial bodies moving about it; the bodies are planets, satellites of the planets, asteroids, comets, and meteor swarms.